Attaining a quality education is critical for achieving job success and personal fulfillment, and to making a significant social contribution. As the value of education rises, the need to finance graduate study becomes greater. 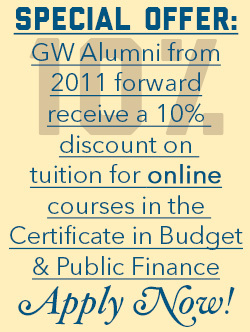 The George Washington University (GW) believes that qualified students should be given the opportunity to continue their academic experience. The Trachtenberg School of Public Policy and Public Administration makes every effort to help students identify and take advantage of the wide range of financial opportunities available within the school and throughout the university community, as well as from external sources. Tuition for the Trachtenberg School is set annually by the Columbian College of Arts and Sciences. The tuition rate for graduate courses for the 2018-2019 academic year is $1,825* per credit hour. *Pending final approval. Learn more about tuition and see an estimate for overall costs. Many fellowships and scholarships are available to students studying in the Trachtenberg School, from internal funding to sources including the broader George Washington University and external resources. Learn more and see a list of pertinent fellowships. Graduate students at the Trachtenberg School are eligible to apply for a variety of federal and private loans, work study programs, grants, and scholarships. Learn more about these funds and how to apply for them. Education in the Trachtenberg School provides students with excellent flexibility in order to handle part time or full time employment while completing a degree. There are many resources available to enrolled students to aid in the job search. Learn more about these resources. Veterans and active duty service members are encouraged to use their Veterans Administration Benefits to help fund a degree at the Trachtenberg School. Learn more about how to apply these benefits. International students have unique opportunities for funding their education at the Trachtenberg school. Learn more about these opportunities and how to apply for them.